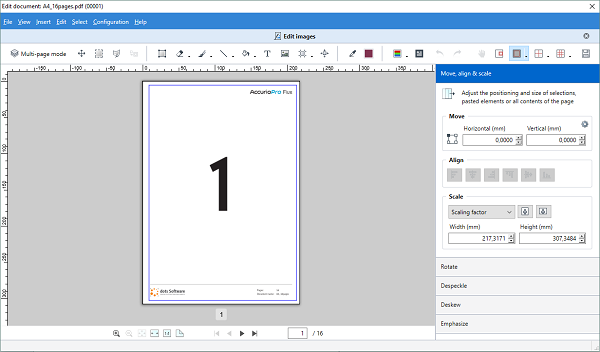 The service release adds support for additional controllers and new functions for the Flux Raster Editor option, which allows you to edit scanned documents and image files. When you edit a document with an indexed color space in Flux Raster Editor, this information is displayed in order to avoid confusion that the document's color mode cannot be changed. The current crop box is displayed in the Flux Raster Editor. Now you can see at a glance whether all objects are still within the area that will be visible on the printout. Previously, the values for moving and scaling objects and for the positioning of guides were specified in pixels. Now the selected standard unit in Flux (e.g. millimeters) is used instead, so that you can better estimate the actual changes in the printout. We added the possibility to predefine a value by which an object is shifted when using arrow buttons or arrow keys. That means you can move objects in bigger or smaller shifts according to the current needs. If you have a valid Software Maintenance Plan (SMP), the update to version 7.8.2 is free of charge.